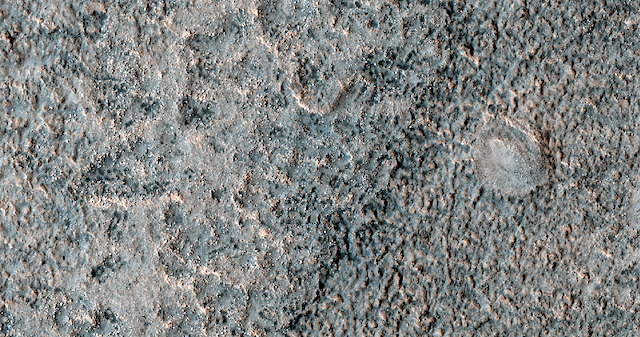 Pitted material and mounds in Chryse Planitia. This rough-looking material has many meter-length pits. What exactly is this stuff? Chryse Planitia shows evidence of water erosion in the past, and is the bottom end for many outflow channels from the southern highlands as well as from Valles Marineris and the flanks of the Tharsis bulge. This entry was posted in Reports and tagged Beautiful Mars, Chryse Planitia, High Resolution Imaging Science Experiment, HiRISE, Mars Reconnaissance Orbiter, mounds, MRO, NASA, pits, Tharsis, University of Arizona, Valles Marineris. Bookmark the permalink.